The final leg of the spirit games in Spokane was played Friday night at Mead HS and it was well worth the price of admission. The home team Panthers capped a sweep over the Wildcats but not without some scratching and clawing. The girls began the night with a furious pace, both teams feeding off of the ruckus crowd that saw the scoreboard light up with a 22-17 end to the first quarter. Mead has so much size and Mt Spokane has so much speed it was interesting to see how it would all play out. As the game progressed it seemed like Mead was blocking everything the lady Cats threw up. Aside from Dallas Flager and Ashlee Pedersen, again, Mt Spokane had no answers. Flager plays with a reckless abandon and loves to push the ball up court looking for any crease to take it all the way. Tonight she played with more purpose than I’ve seen in prior games and showed more composure on when to shoot and when to back off. Number 32 delivered in the game with a quick pop 3-pointer, a nice lefty drive with a fine floater, and a handful of steals completing a nice all around game, proving she can play with Mead’s giants. “Splashlee” again impressed with a fearless infiltration of the home squads defense blowing past them on breaks numerous times and finishing strong at the rim. She collected more than a handful of rebounds, steals, and deflections while also racking up three bombs on her way to counting 23 beans. The Mead girls again showed their experience and size blocking shots all night long beginning with Sue Winger. This “dynamomma” came out in the first quarter hitting threes, getting steals that lead to breakaway baskets, and finishing everything she started! It was absurd watching those green feet do all that work, but by the end of the game I recognized her as the most dominant player on the floor tonight! (Hey, I’m just kidding about the shoes, I’m sure there’s a method to the madness and it makes you easier to pick out in the game film!). If you haven’t seen PG Douglas play (sorry, I can’t spell your first name right now as the Seahawks are making plans to drill that guy for the Broncos this weekend) you should, she is a very special little player and probably the most natural athlete in the girl’s game today. She has great jumping ability and overall fluid movement. I really noticed how she understands spacing and how nice her passes are when she’s simply swinging the ball around. “P” is going to be a great point guard in this city, just wait and watch as she is only a sophomore. I can’t end this review without sending some “pub” toward DJ. Delany Junkermier…. her midrange game is un matched and her ability to hit open threes are just two simple reasons why she will be going on to DI hoops next year. Just go see her play before it’s too late, it’s always fun to watch a scorer. The Boys game tonight was interesting to say the least. 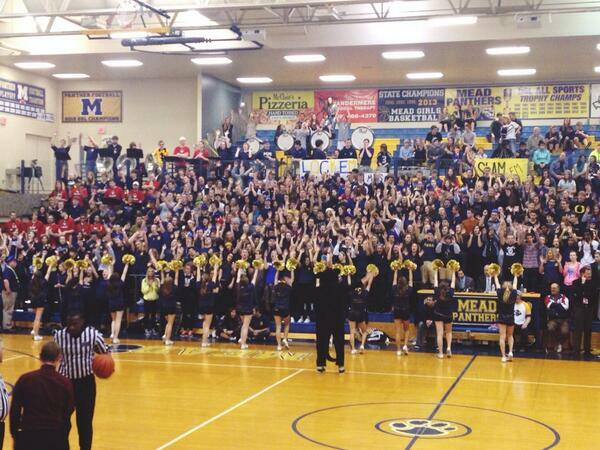 Mead has one of the better squads and can match up man for man against any team in the city. At each position they usually have an advantage in individual talent and tonight was no different playing their cross highway rivals. Somehow Mt Spokane hung around mostly due to Stu Stiles in the first half, by the way this kid can score in as many ways as you can think of but that wasn’t the key. Although he had a prime time first half scoring 16 points and I even saw him get fired up once, it just didn’t explain why they stayed close throughout the game. The key was that the Wildcats stayed patient on offense, running their motion waiting for openings and forcing the Panthers into tough shots. The box score doesn’t show it but Dillon Moran had an admirable game controlling the half court and finding open teammates, or letting Stiles finish with the shot clock dwindling. Dillon has a very quick first step and can go by people en route to the rim where he will finalize a play fighting through contact. He’s a tough dude and has heart that spreads throughout his teammates and that’s what kept this game close. Alas Ben Stevens stepped up and looked very comfortable and confident becoming more involved in the offense, grabbing offensive rebounds and cutting without the ball for layups. He made a couple of challenging shots and made his way to the free throw line. He may be developing into a “watch dog” on the CATCH SPOKANE list of players to CATCH! As for the Panthers, I cant’ say enough about Brandon Pettersen in tonight’s match up. He plays much bigger than he is most of the game setting picks and snatching boards, but also has the ability to hit the phone booth and change into his little man persona and drive past his defender as a playmaker every time the clock is winding down. He looks like a mismatch every time down the floor to me, and tonight he brought the jungle cat to the party scoring anytime he wanted to or forcing his way to the line. It was a good showing for the junior.